You’ve worked hard at finding the right tenants for your apartments. Whether you manage high-end apartments or economy apartments, quality is your tenants’ main consideration. With many tenants using your units and other amenities, apartment odor can surface. In fact, the number one complaint from occupants is tobacco odors in hallways and rooms. It doesn’t matter if your rooms are smoke-free or not, some tenants will smoke. The smoke gets absorbed into linens, upholstery, drapery, and carpeting. That makes for a sour impression for any new renter entering an apartment for the first time. Aire-Master can help you make a great first impression. Our odor control service is simply the best. You see, we don’t mask odors; we eliminate them! That’s because our deodorants attack odors at the molecular level — leaving odor-causing molecules odorless. We will eliminate unpleasant odors in rooms and fabrics, kitchenettes, showers, restrooms, and hallways. Let Aire-Master be your problem-solver! Pet owners love their pets. In fact, many of them treat their furry friends like their own children. Unfortunately, along with pets come the many odors associated with them — accidents, spills, and messes on floors, carpets, and fabrics. Aire-Master is here to help. We will eliminate unpleasant odors caused by tenants and their pets in rooms, hallways, and lobbies. What’s left is a light, welcoming fragrance. Your fitness center can be a breath of fresh air! You have done your part at catering to your fitness-focused residents by providing a fitness area. After all, it’s an amenity that’s a deciding factor for many tenants when looking for an apartment. Your staff has done a great job keeping these areas cleaned and maintained, but clean doesn’t always tackle the common, unpleasant odors that can build up. Your tenants’ first impressions are crucial. This is where Aire-Master can help. We’re your personal trainer of odor control and disinfecting! We can make your clean fitness center smell clean and keep it virus and germ-free. We will eliminate unpleasant odors in workout areas, spas, showers, restrooms, and locker rooms. Also, we have disinfectants available that can eliminate the MRSA virus as well as Hepatitis B (HBVB), Hepatitis C (HBVC), HIV, and VRE on all touch surfaces. Keeping a clean establishment for your tenants is your main priority. Residents expect it. All your hard work should be seamless and invisible. But keeping odors and flies invisible from residents is especially difficult when dealing with trash dumpsters and trash receptacles. After all, they’re a breeding ground for sour odors and a smorgasbord for germ-carrying flies. You can’t ignore these problems, and your tenants certainly won’t. Let Aire-Master help. No one does odor control quicker and better than we do. We will eliminate unpleasant odors and flies in food prep and service areas, trash and dumpster spaces, loading dock entrances, and more. Let Aire-Master be your problem solvers! Seconds after potential tenant walks through the front door of your of office, they’ve formed an opinion about your apartment complex — whether good or bad. You can do more than just eliminate unpleasant apartment odor; you can create a positive impression for your brand. That’s the power of Scent Marketing. Scent marketing is the best-kept secret of many big companies and the most neglected tool in marketing. No other sense is as powerful on our emotions and recall as our sense of smell. Aire-Master brings you this effective tool to add to your marketing strategy. And best of all, it’s affordable no matter the size of your lobby. Aire-Master fragrances are unique custom blends, designed for maximum performance and aroma quality. We offer a widest variety of fragrances. We’ll put scent marketing to work for you by helping you select a fragrance that is suited for your guests and environment. Flies are disgusting! They carry dozens of diseases, lay eggs everywhere, and they’re annoying. Nobody likes it when they are buzzing about — especially customers. Let’s shine a spotlight on fly control and look at ways to get rid of this pest. In food and drinking establishments, fruit flies may come already inside produce containers. Once they enter a facility they go directly to sink drains where there is a food source attached to the insides. 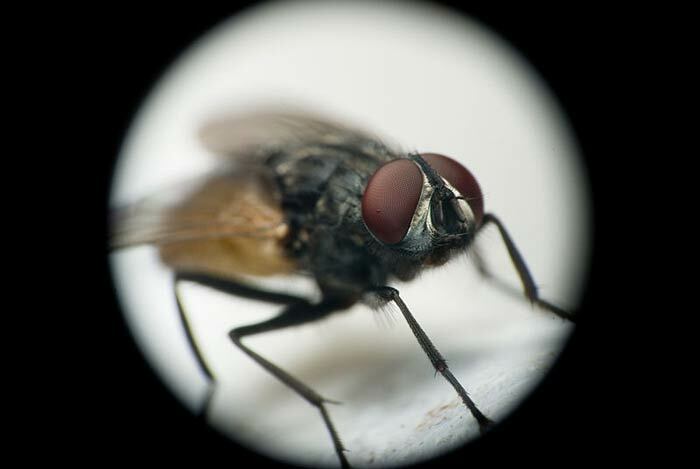 Houseflies come through entry doors and drive-thru windows. They immediately head towards a light source such as exterior windows and light fixtures. The last thing you want for your customer is to eat with one hand while shooing away flies with the other. It’s time to take action before you lose customers. Fruit flies and houseflies present in commercial kitchens visit trash containers. Then they land on food prep surfaces, cooking utensils, and dishware. Contamination is then transferred to those preparing and eating the food. Customers and employees appreciate a fly-free area. A business loses customers when they perceive they are getting sub-standard service. Fly infestation immediately adds to this negative perception. On average, a dissatisfied customer will tell a negative experience to ten other people. Each time they tell their story it gets embellished a little more. By the time the tenth person hears the story, it can have morphed into an extreme exaggeration. The great news is customers will return if the business takes care of their fly problem. Aire-Master can help you develop a fly control service for your business. Let us help create a no-fly zone quickly and cost-effectively. Contact your local Aire-Master representative and get ready for the upcoming fly season. Install this decorative wall-mounted unit on the “fly highway” where flies travel. 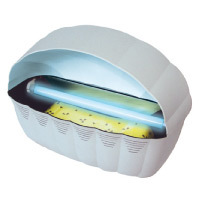 Contains a UV light to draw flies and other insects into the trap. Covers an effective trapping area of 4,000 square feet. Trapping surface includes food attractants and mating patterns of flies. Once insects land on trap they are stuck and never leave. Advancing trap surface keeps insects in an enclosed compartment. There are no flying wings, legs or antennae lying about. Safe for use around people, pets, and food prep and eating areas. Install this decorative wall-mounted or stand-alone insect unit near sink drains where fruit flies and gnats feed. 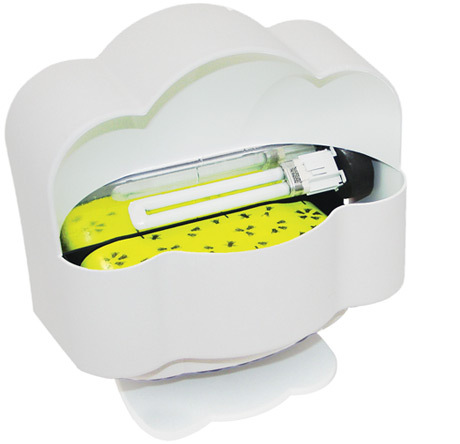 The small size is excellent for placing on counters or near floor drains at the close of business each day. Covers an effective trapping area of 1,000 square feet. Trapping surface includes food attractants and mating patterns of flies. Insects land on trap and get stuck. Advancing trap surface keeps insects enclosed and out of the way. There are no bug parts left around to be seen. Safely use around people, pets, food prep and eating areas. This system has an auto-default mode that sprays every 15 minutes; 24-hours a day. Kills flies, mosquitos, and other flying insects. EPA registered and authorized for use under USDA inspection and grading programs. Leaves no lingering insecticide odor. Install this waterless trap in floor drains to prevent drain odors and pest infiltration. Crawling insects such as cockroaches are unable to enter or leave the drain once the drain trap is installed. There are no pesticides needed. The Green Drain is Universal-Plumbing-Code Certified. It does not impair plumbing maintenance, and it provides sewage backflow protection. Safe for use around people, pets, food areas. This super concentrated product contains citronella oil, which is a natural insect repellant. Simply spray problem areas to help repel flies and crawling insects. Use around doors and windows, trash and dumpster areas, and outdoor patios. Safe for use around people, pets, and food preparation and eating areas. Blue Lagoon is a water-based, super-concentrated liquid deodorant that eliminates all types of odors on hard and soft surfaces. This product is extremely cost effective — one concentrated gallon can be mixed with water to make up to 32 ready-to-use gallons. Because it contains citronella oil, a natural insect repellant, Blue Lagoon can help control flies and mosquitos. It is environmentally friendly and safe for use around children, people and pets. 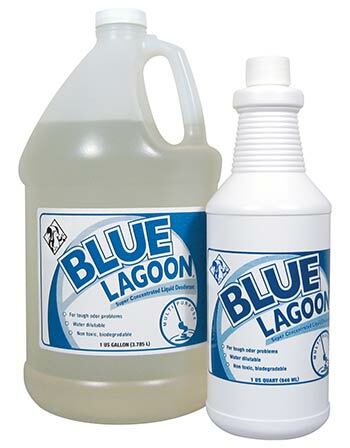 Use Blue Lagoon in wash water to mop hard surface floors, using 4 oz. to filled mop bucket. Use a spray, 1 oz. to 16 oz. of water, to clean desktops, chairs, and other surfaces above the floor. Spray into air conditioning and heating vents and filters. Use 1 oz. to 16 oz. of water. Place a shallow pan with undiluted Blue Lagoon in crawl space or basement to eliminate odors caused by rodents, mildew, or animal urine that may have permeated subfloor. Mist carpets, drapes, and furniture to eliminate smoke, food, and pet odors. Spray and wipe vanity surfaces with a 1 oz. to 16 oz. water dilution. Spray around fixtures during the day and spray into air conditioning vents and heat vents. Mop the floor with a 2 oz. to 1 gallon of water dilution. Pour into floor drains to prevent sewer gas odors. Use Blue Lagoon in place of shampoo to clean the carpets. Use 1 oz. to 1 gallon of water as shampoo in carpet cleaner extraction equipment. Clean as much matter from carpet as possible. Apply undiluted Blue Lagoon liberally, allowing it to penetrate to the subfloor. Allow to dry, treat again if necessary. For general control of pet odors, use 2 oz. to 16 oz. of water. Spray in litter boxes, kennels, pet beds, garages, etc. Spray on animals, avoiding eye area. Spray undiluted into dumpsters, trash chutes and recepticles to control odor and flying insects. Use Blue Lagoon and laundry detergent to eliminate odors in clothing, sheets, and towels. Mix 2 oz. per 30 lb. load. Mist comforters & sleeping bags to freshen between dry cleanings. Dilute at rate of 2-4 oz. to each of 5 gallons of water (2 gallons per 400 gallons of water). Use Blue Lagoon to wash windows, mirrors, and chrome. Use 1⁄2 oz. to 16 oz. of water. Use as a spray for refrigerators, diaper pails, and other surfaces. Use 2 oz. in 16 oz of water. When the weather gets warm, here come the flies. Flies visit dumpsters, sewers, and garbage areas, feeding on all sorts of moist, decaying matter. House flies are suspected of transmitting at least 65 diseases to humans. Nobody likes to see flies buzzing around, especially customers and health inspectors. 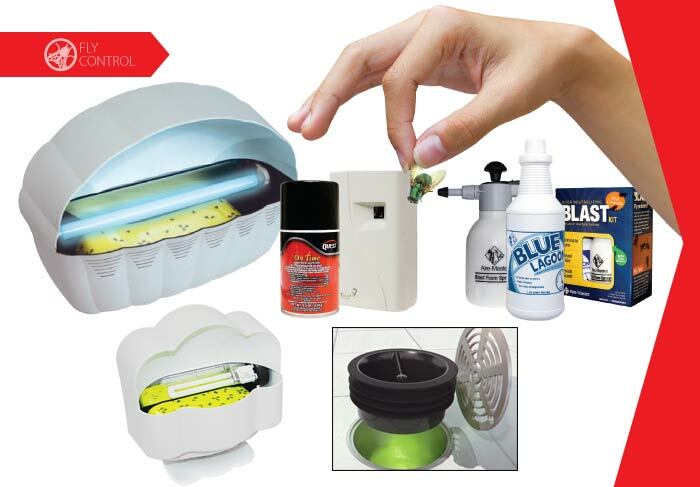 Aire-Master can help make any fly problem manageable by using a combination of safe, effective insect control products to establish a line of defense against the vile offenders. We offer a simple monthly service that will create a no-fly zone in your establishment. Contact your local service representative to set up the right program for you.